JEFFERSONVILLE, Ind. – After decades of discussion, the Louisville-Southern Indiana Ohio River Bridges project is officially underway. At a ceremony today, Indiana Gov. Mitch Daniels, Kentucky Gov. 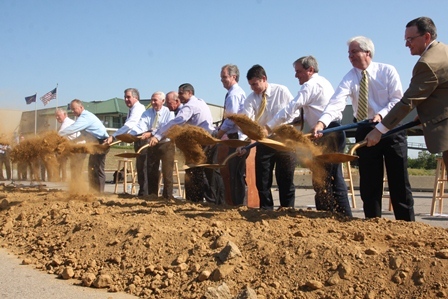 Steve Beshear, Federal Highway Administrator Victor Mendez and a host of federal, state and local officials broke ground on the first construction phase of the major project – a 3,000-foot extension of Old Salem Road. When the East End Crossing opens to traffic in 2017, Old Salem Road will be the first exit on the Indiana side of the river, providing improved access to the River Ridge Commerce Center and the Port of Indiana-Jeffersonville, where today’s ceremony was held. “Decades of waiting for greater convenience and quality of life in the metro area will soon be over, but that’s only part of what’s ahead: Southern Indiana has tremendous economic prospects and these new bridges are the key to making them real,” Gov. Daniels said. Gohmann Asphalt and Construction Inc. of Clarksville, Ind., was awarded a $3.2 million design/build contract earlier this month and has already begun performing final road and bridge design. Construction begins this fall with the Old Salem Road extension scheduled to open in June of 2013. Officials arrived at today’s groundbreaking ceremony in late 1960s Ford Mustangs that were crossing existing Louisville-area bridges when the proposed East End Bridge was first included in the region’s long-range transportation plan. The Bridges Project involves construction of new bridges across the Ohio River between downtown Louisville and Jeffersonville, Ind., and between Prospect, Ky., and Utica, Ind. In addition, the project will dramatically improve the Kennedy Interchange, where Interstates 64, 65 and 71 meet in downtown Louisville, and the existing Kennedy Bridge that carries I-65 traffic. The Bridges Project will improve cross-river mobility and increase safety in one of the nation’s most congested and important highway corridors. In the process, it will create thousands of jobs, both in short-term construction and in long-term economic development. Each state is responsible for procuring and overseeing construction of a portion of the $2.6 billion project. Indiana is responsible for the East End Crossing and Kentucky is responsible for the Downtown Crossing. By year’s end, both Indiana and Kentucky are expected to select contracting teams that will build each state’s portion of the Ohio River Bridges Project. Construction on both bridges is slated to begin in 2013. The East End Crossing is expected to open in 2017 and the Downtown Crossing in 2018.